If you’ve browsed a craft blog, opened an interior book or flicked through a women’s magazine lately, chances are you would have spotted some sweet lines of bunting. Follow our easy step-by-step instructions and make your own! 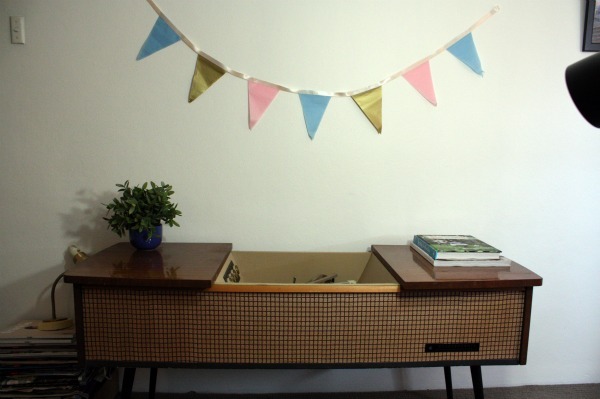 It’s the DIY rage that’s taking crafty circles by storm. Bunting is surprisingly easy to make, very easy on the hip pocket and looks fantastic in any room of the house. Bring some colour to your bathroom or kitchen, choose cute patterned fabric for the kids’ bedrooms or playroom or add some sweet pastels to a guest room. Bunting also makes a perfect garland for special events like weddings, high teas, hen’s afternoons and baby showers. There are plenty of how-to guides for creating fabric bunting on the internet, but why not be a bit different and try our two cute versions below or get inspired and come up with your own! Make a cardboard template roughly the size of the triangles you’re after. We’d suggest sides measuring about 12 centimetres x 18 centimetres x 18 centimetres. Place the template on a folded stack of tissue paper (this will help save time, as you’ll be cutting multiple triangles at once) and draw around the outside of the template. Using your Stanley knife, hold the tissue paper taut to prevent it from tearing, and cut the three sides of the triangles. Repeat Steps 2 and 3 with different colours of tissue paper. Cut the ribbon to fit the size of your space, keeping in mind that you’ll hang it in a curved semi-circle. Cut pieces of double-sided tape and place them along the smallest side of each triangle, then press onto the ribbon. Repeat, moving from one side of the ribbon to the other, until the ribbon is full of triangles. Turn over so the triangles fall behind the ribbon. You can tie knots in the end of the ribbon and hang from hooks or use double-sided tape/Blu-Tak to attach directly onto the wall. Gather your doilies and cut in half to form semi-circles. Cut the ribbon, as per instructions above for tissue paper bunting. 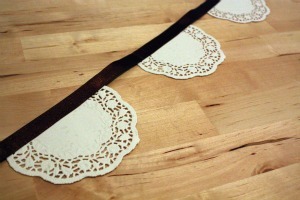 Cut pieces of double-sided tape and place them along the straight edge of each semi-circle doily. Starting from one side and moving across to the other, press the straight taped edge onto the ribbon, repeating until the ribbon is full. Turn bunting over and hang as per instructions above for tissue paper bunting.